Dani’s is one of those institutions that also happens to be located in one of those Tudor buildings that still thrive in Forest Hills and Kew Gardens, lending it just that extra veneer of Queens charm. 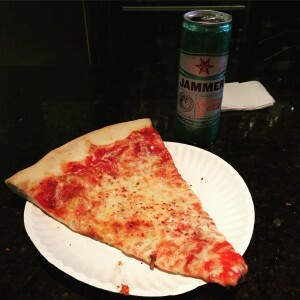 Brooklyn has classic pizza, too, obviously but not served in a corner Snow White cottage. I’ve only come to know it recently after I’ve started getting my hair cut across the street at the suggestion of a young Montenegrin (or Macedonian? I always confuse the two) woman I met at a party last year when she learned I was moving to Jackson Heights. It’s great—the cut is only $25 (it’s double with a blowout, which is maybe more standard for ladies, but I don’t like them) and you can have a mimosa or cappuccino. It’s a salon not a barber shop. The plain slice is substantial. I originally thought I might wait it out for the pesto style I keep hearing about that wasn’t on display and never appeared in the 20 minutes or so I occupied a seat, but one slice was filling enough. The sauce is sweet, maybe too sweet for some tastes (counterbalance with an aggressive shake of chile flakes) and the mozzarella is laid on thick and melty, like kid pizza, you know, as if a grade school served pizza that actually tasted good. Pizza isn’t allowed in the dining room and the pizza operation itself isn’t more than a narrow takeout counter that happens to have six diner-style stools bolted down at the far end near the kitchen. The upside of snagging a seat is having more than soda with your slice. A pair of older women were nursing glasses of red wine, but beer is where it’s at. 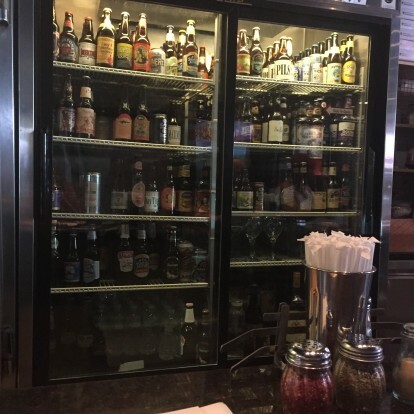 There’s a whole refrigerator filled with beers, most more exciting than what you’ll find at your local Queens bodega. A Gose brewed with coriander and sea salt from the Oregon coast? Sure, why not. I wasn’t paying attention, but I’m pretty sure the slice and beer were $6. It’s hard to argue with that. 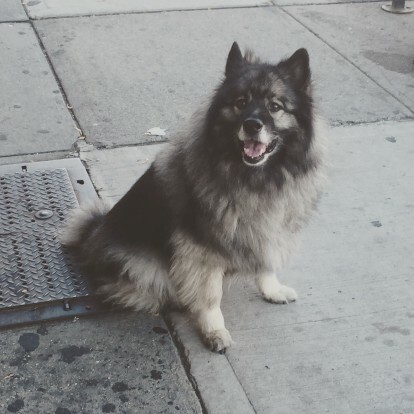 I referred to this handsome canine (that’s saying a lot coming from a cat lady) on Instagram as a pizza dog. It turns out his name is Pete. I don’t imagine his last name is Za, however.